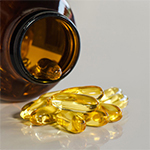 MONDAY, Aug. 1, 2016 (HealthDay News) -- Heart attack patients who took high doses of fish oil supplements for six months showed improved heart function and less scarring, researchers report. It is not yet precisely known how the large amounts of omega-3 fatty acids in these supplements might have helped the healing process, but the results are encouraging, said study senior author Dr. Raymond Kwong. He is director of cardiac magnetic resonance imaging at Brigham and Women's Hospital in Boston. In his study, 360 heart attack survivors were followed for six months. Half of them were given 4 grams of omega-3 fatty acid supplements daily for six months, while the other half were given placebo pills. A doctor might typically prescribe 1 to 2 grams of omega-3 fatty acid supplements a day if a patient has high triglyceride levels (a type of blood fat), Kwong added. Using MRIs of the heart, the researchers found there was a 6 percent improvement in both heart function and scarring in undamaged parts of the organ among patients who took 4 grams of omega-3 fatty acids daily. "What we need to study going forward is whether higher doses of omega-3 can reduce mortality rates. Can we do better than produce 6 percent heart improvement and 6 percent less scarring?" Kwong asked. Dr. Gregg Fonarow, a professor of cardiology at the University of California, Los Angeles, said prior studies where lower doses of omega-3 fatty acids were given after heart attacks had yielded "mixed results." And how omega-3 fatty acids might improve a patient's heart health "has been the subject of much debate," he added. "The value of the study[new] suggests that fish oil supplementation at the 4-gram daily dose may help with the heart healing process after a heart attack, and suggests that further studies are warranted," Fonarow said. Kwong hopes more studies of omega-3 fatty acids and heart attack recovery can discover why the higher doses produced more positive results. He said he was prompted to conduct the study after improved MRI technology made it possible to take a closer look at heart function and scarring of undamaged parts of the muscle. Omega-3 fatty acids may permit the heart to contract more easily and reduce swelling in undamaged regions, Kwong noted. Fish oil has been popular for decades among people looking to lower blood pressure, decrease inflammation, slow the progression of artery-clogging plaque, decrease clotting tendencies and lower the chance of irregular heartbeats. Good sources of omega-3 are salmon, halibut, tuna, sardines, mackerel, herring and trout, according to the American Medical Association. Omega-3 fish oils contain fatty acids that the body needs but cannot produce itself. The study's suggestion that high doses of omega-3 can help improve recovery after a heart attack is a provocative finding, Kwong said, although the research was not designed to prove that high doses of the supplement could actually lower the risk of death after heart attack. "Our study was not about mortality," Kwong explained. "It was about looking at fish oil and the heart using improved MRI technology. This opens opportunities for more studies." No matter how future studies on omega-3 turn out, heart attack patients must still pay strict attention to proper diet, exercise and ways to reduce stress, Kwong added. People should consult their physician before taking any type of supplement. Funded by the U.S. National Heart, Lung and Blood Institute, the study was published Aug. 2 in the journal Circulation.